Collection bundle including all the DLC. The Mac App Store version is a complete edition with all DLC but does not include multiplayer. Download the Package File Manager and extract it anywhere. Open PackFileManager.exe and select Cancel on the Please point to location of TWH, ATW and R2TW prompts. On the Please point to location of STW prompt select the game's main installation folder. Select Cancel for NTW and ETW. Select Yes on the First Start window which says Looking for updated schema files for decoding DB files. Under Game, check if STW is selected. Under Options, select CA Packs Are Read Only, then choose I'm not afraid, coward! Double Click on movies.pack and movies in order to expand the list. Click on a file to select it, then push Delete once to erase it. Delete the following files. 4. Push Ctrl+S in order to save, then wait for the Package File Manager to unfreeze. Select legal.dds, then push Delete once to erase it. Push Ctrl+S in order to save, then wait for the Package File Manager to unfreeze. Push ⊞ Win+R and type %LOCALAPPDATA% then push OK.
Find the PackFileManager folder and delete it. Delete the older Pack File Manager folder that was last downloaded and extracted anywhere. Download the latest version of the Pack File Manager and extract it anywhere. Set the Shader Model setting to Shader Model 5 and check the Soft Shadows setting while in the DX11 mode to use high quality shadows. Switch to the DX9 mode if loading takes too long. If the shadows are blocky uncheck the Soft Shadows setting. Shadows on this mode are worse than in the DX11 setting. 3. Launch the game and wait for the main menu to load, then Alt+Tab ↹ to the Desktop. 4. Use the Fullscreen Toggle Script. Dolby Surround, SRS Circle Surround, 4.0, 5.1, 6.1, 7.1, 8.1 are supported. 8.1 Discrete lower the volume considerably, unknown if it was intentional or a bug. 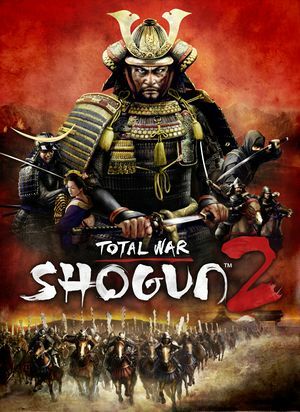 See Helix Mod: Totalwar Shogun 2 [DX9] or Helix Mod: Totalwar Shogun 2 [DX11]. Multiplayer modes are not cross-platform. The Mac App Store version does not include multiplayer. No proper fix known yet. The game does not restrict the mouse cursor, meaning that on multi-monitor configurations instead of moving the camera, the mouse will go onto the other screen, effectively crippling the ability to effectively move the camera in that direction. Select "Open Program Args" and put in -applaunch 34330. Select "Lock Program" and then find the path to the game's main executable in the installation folder. 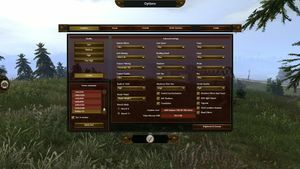 Click the "Create Shortcut" button to create a permanent shortcut to the game with Cursor Lock. Shogun 2 suffers from rather ridiculous loading times (the first loading splash screen can take over 5 minutes to load. However, these can be partly shortened by switching from DirectX 11 to DirectX 9. This will restrict the game to use Shader Model 3 and MLAA among other things. The game freezes because Windows cannot allocate enough memory on x86 systems. Wait for the confirmation message. The game is limited by its 32-bit nature and will fail to correctly detect the available VRAM size on cards with more than 4 GB of memory. Modify gfx_video_memory setting and set it to -1. This will effectively set the available VRAM size to 4GB - 1 byte. To undo this change, follow the same instructions but use the value 0 for auto-detection. Mouse and keyboard camera controls no longer function. Save and reload the savegame from Shotgun 2. Not supported: ATI Radeon X1000 series, ATI Radeon HD 2000 series, Intel GMA series, Intel HD 3000, Nvidia GeForce 7000/8000 series, Nvidia GeForce 9400 and Nvidia GeForce GTX 300 series. Intel HD 4000 requires 8 GB of system memory. This page was last edited on 29 March 2019, at 10:28.